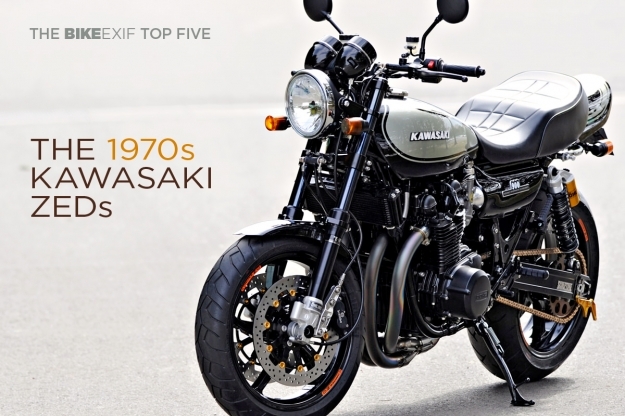 In the early 1970s, two Japanese superbikes ruled the roost: the Honda CB750 and the Kawasaki Z1. The Z1 was originally going to be a 750, but when Kawasaki got wind of the CB750 in the late 60s, they decided to up the ante by increasing capacity to 903cc. It was a wise move. On its launch in 1972, the Z1 wowed journalists with its 82 bhp output and 130 mph top speed. It was smooth and stylish as well as powerful, and buyers loved it. Upgrades ensued: In 1976 the Z1 was replaced by the Z900, and a year later, the Z1000. Later models didn’t quite have the charisma of the 1970s Zeds, so we’ve stuck with the early models for this Top 5. A little digging reveals some very tasty café racers—and builders on a quest for even more explosive performance. 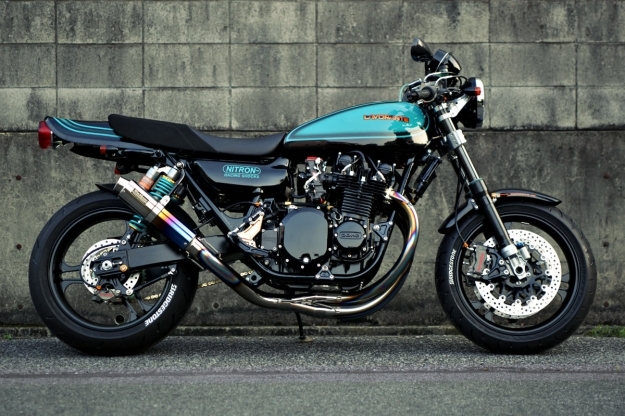 Bull Dock x Nitron Z1 There’s a whole subculture in Japan devoted to resto-modding Z1s. AC Sanctuary is the most prolific workshop, but we love this effort from Bull Dock. By Japanese standards it’s a subtle bike, with low-key paint in the brand colors of the British suspension specialist Nitron. The build follows the typical Eastern recipe: a reinforced frame, a motor bored out to 1015cc, Keihin FCR carbs, a trick exhaust and completely new suspension and wheels. Get the full specs here. 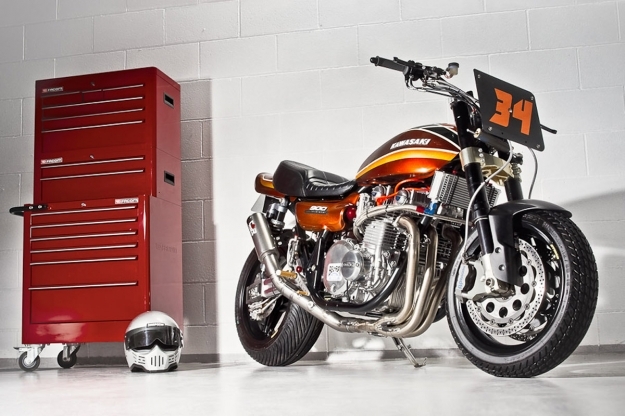 Racefit Z1 The English firm Racefit is well known for its exquisite race exhaust tubing, but owners Jon Keeling and Phil Atkinson are dab hands at building custom motorcycles too. This one has a big-tube Spondon frame, hooked up to 50mm Marzocchi forks and WP shocks. Wiseco pistons, Kent cams and Mikuni carbs ramp up the power output, and the wheels are lightweight Dymag items. The candy paint, from House of Kolors, is even better than you’d find in Tokyo: it’s the perfect evolution of the classic ‘root beer’ scheme. Photography by Paul Bryant of Kinetic Images. Wrenchmonkees #36 If you check out the portfolio of Scandinavia’s top custom shop, you’ll notice it’s crammed with Kawasakis. Builders Per and Nicholas have a taste for retro Japanese superbikes, but not the gaudy, blinged-out resto-mods you’d find in Japan. 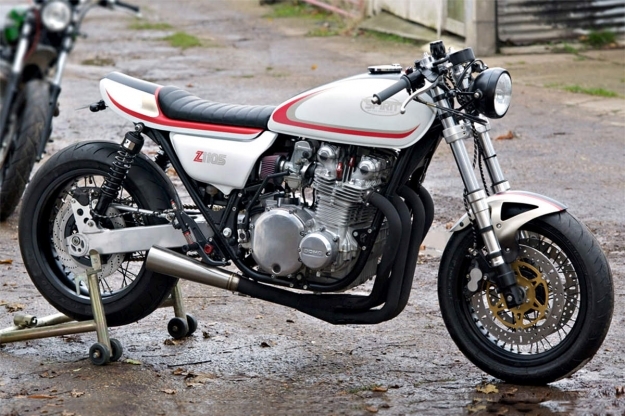 This Z1000 is typical: stripped back, hotted up, and finished with a monochrome paint job. The motor has been rebuilt with a Wiseco big bore kit, and the swingarm, forks, wheels and brakes are from a later-model Suzuki sportbike. Low, fast and just about perfect. That meant a rebore out to a whopping 1105cc, polished cylinder heads and Zircotec-coated exhaust headers. Keeping the show on the road are Triumph Daytona forks up front and a beefier rear wheel, housed in a customized Zephyr 1100 swingarm. Kurumazaka Rickman Z1000 Kawasaki got ‘the look’ exactly right when designing the Zeds, so you rarely see radical makeovers or fairings. But this machine is not strictly a factory bike. 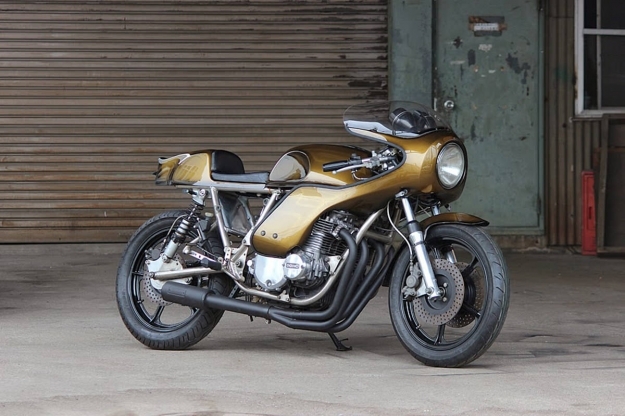 It’s a Rickman special that had fallen into disrepair and has been painstakingly rebuilt by the obscure Japanese shop Kurumazaka. The classic nickel-plated frame has been tweaked to ensure that its looks finally match its performance, and the fairing and tank cover have been re-mounted with new brackets to improve the lines of the bike. The mechanicals have been refreshed or overhauled, with discreet additions such as new switchgear and LED lighting. And the new paint job? Pure gold, don’t you think? Image © Street-Ride magazine, Japan. Top image: AC Sanctuary’s RCM-283 Z1. 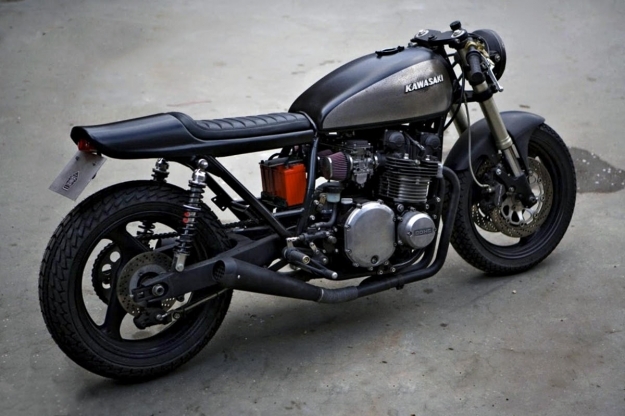 Last week’s Top 5 covered the best Modern Motorcycles for customizing.